Between Chloe the Super-Pup and the normal summer crush of grants and projects at work, I haven't even thought of the site. Sorry bout that. The mini-comics do keep arriving and plenty are waiting to be reviewed next week. Hope everyone had fun at MoCCA! I'll be back in July. 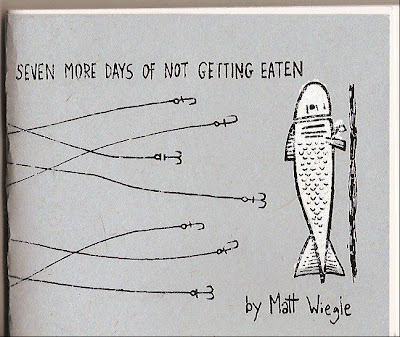 Seven More Days of not Getting Eaten by Matt Wiegle Matt Wiegle has a knack for turning folk tales and legends into disarmingly funny and thoughtful mini-comics. Seven More Days of Not Getting Eaten is no exception. Over seven days, a talking fish manages to manipulate some not too bright anglers out of cooking him for dinner. Over seven stories, the fish proves much smarter than the assorted fishermen who cast their line into his stream. The fish convinces one fisher to let him go so he can change into a better suit, "I was lamenting the shame of being caught without my best suit on." He convinces another fiherman to attempt to build a fire underwater, "Get those twigs! Yes! Yes! 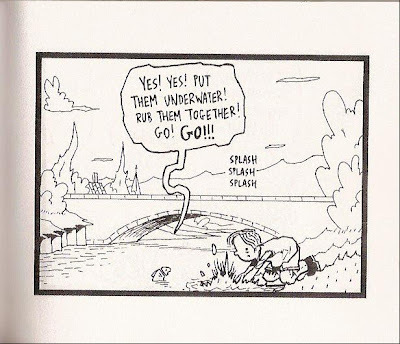 Put them underwater! Rub them together! Go! Go!" This sequence had me laughing out loud both times I read this mini. To be honest with you, I'd recommend anything that Matt produces. 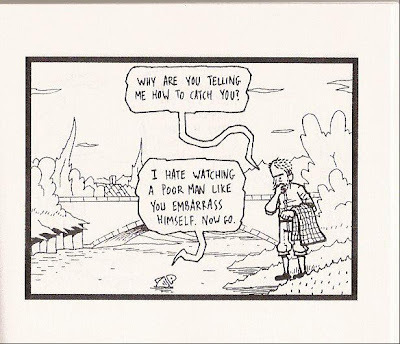 His mini-comics have not missed yet. Each of them transcend the mere form of mini-comic and possess that quality that makes them something you want to treasure. Seven More Days is 76 pages for the ridiculously low price of $3. From the Partyka website catalog: Teach a man to fish, and he will eat for a lifetime," goes the old axiom. Well, fine, Mr. Axiom, but while you're busy encouraging every oaf in the kingdom to trudge down to the river with a crudely made pole, the fish will be busy teaching themselves whatever trickery will help them survive. 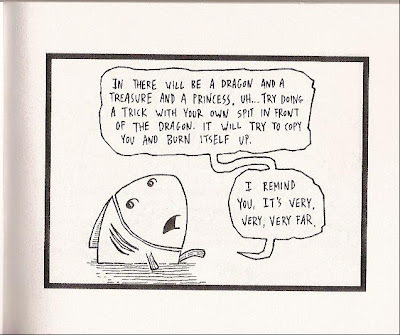 In this book, fishkind bamboozles mankind for seven days. Also: punching; dampness; screams of terror. Go buy it. Go buy everything on the Partyka website. It's all fabulous. If you don't believe me, here's today's Daily Drawing by Sara Edward Corbett - "Rat of the Sky."